10,000 Year Clock, a New Age Mayan Calendar? Understanding our future requires a little ingenuity interpreting out past, but it also means examining what we are doing currently and how it's changing events to come. Just as our ancestors have taught us about their lives through megalithic structures, stone carvings and incredible artifacts, we are also leaving information for our distant descendants to discover and ponder in a similar light. A monumental project to build a gigantic clock is underway in Texas which may provide exactly the same sorts of questions we currently ask of our ancestors, to generations of humans living 10,000 years from now. 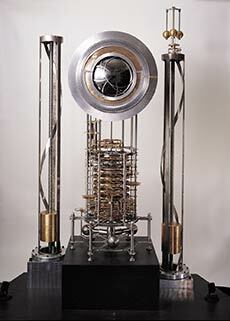 The 10,000 year clock is designed to last throughout the ages with a century hand that only ticks on the century, a millennium dial, and even chimes said not to repeat their tune once during the 10,000 year duration. Hi-tech ceramics, stainless steel, and stone components makeup components intricately designed to transcend generations while relying on fluctuations of thermal activity in the mountain for power. While keeping Long Now Time, the 10,000 year clock is also capable of providing the accurate time of day through visitor intervention. In order to save power, someone seeking the current time or audience with the clock chimes must ask the clock by turning its dials. Looking at the concept behind this invention, it almost begs to wonder if that too was the purpose of such devices like the Mayan Calendar. A stone clock designed to keep time over 5,000 years but only decipherable through human intervention. Will our descendants pose the same question over the 10,000 year clock as we have over the Mayan Calendar? Does something lift altering occur the moment this clock ticks to its ten-thousandth year? Perhaps when the true purpose of the device becomes lost in time, will distant civilizations require an explanation for the device. Time only tells what we program it to keep.